Cape Nagasakihana (長崎鼻の初日の出) is located in the eastern end of Honshu Island of Japan. It has the fastest sunrise in Japan. 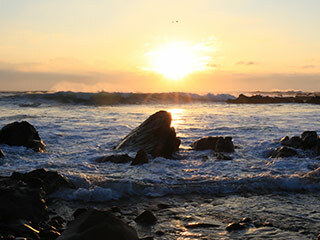 At the new year's day, many people visit here and enjoy the great sunrise of the year. There are parking and restroom at the port. Need a car to see the sunrise. Drive 126 to 268 to 254 and park at Sotokawa Port. Cape Nagasakihana is located in Choshi, Chiba Prefecture. It has a great view of Pacific ocean.